This elaborately chased cup and cover is first recorded in the Carlton House Inventory of Plate. It was said to have been 'presented by His Majesty Charles the First to one of the Principals of the University at Oxford, whilst holding the Parliament in that City'. In 1843 the cup was illustrated and described (in its original partly gilt state) in Henry Shaw's influential publication Dresses and Decorations of the Middle Ages, where an alternative account of its early history is given. Shaw, apparently with the help of John Bridge (of Rundell, Bridge & Rundell), records that the cup had formerly belonged to Charles II and that he had presented it to a Master of Queen's College, Oxford, for services to his father during the Civil War. The cup is said to have remained in the same family until the 1820s when it was bought by Rundells and sold by them to George IV. Given John Bridge's involvement, Henry Shaw's account is probably more reliable than the Carlton House inventory. It is unlikely that Charles I would have given away such an object at a time when the Jewel House was heavily depleted and the King had requested plate from many individuals and institutions, including the Oxford colleges, to help finance the royalist army. 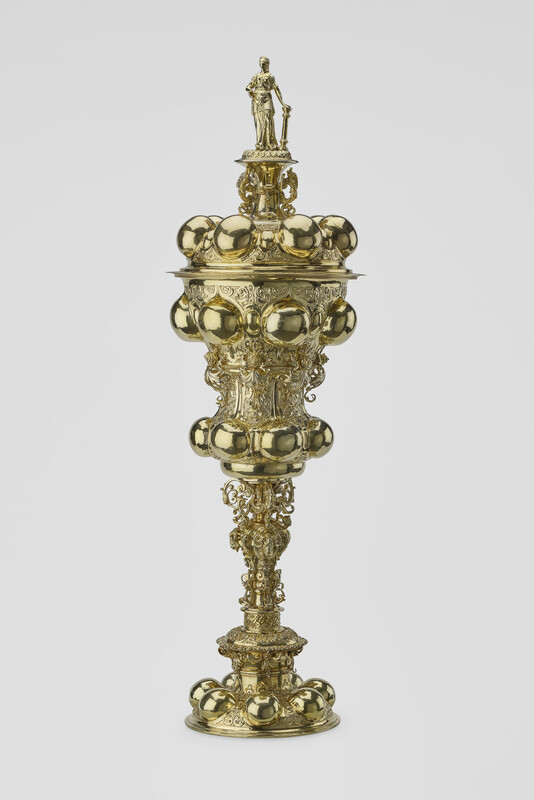 This cup and cover is a particularly large and elaborate example of the type of presentation vessel popular in Nuremberg in the late sixteenth and early seventeenth centuries. With its tall, slender and organic form, embossed bulb decoration and filigree foliage, it is typical of the neo-Gothic style adopted by Nuremberg goldsmiths at this date. Finial figures representing the Virtues were popular; on this cup Fortitude is symbolised by the column. In 1606, Michel Haussner (master 1601; about whom little else is known) supplied a similar Knorretes Trinkgeschirr ('burred' drinking cup) to the Nuremberg City Council, surmounted by the figure of Patience. Rim of cup struck with city mark of Nuremberg (entirely worn); cover, rim and foot of cup struck with maker's mark of Michel Haussner. Rim of cup struck with mark of Nuremberg (entirely worn); cover, rim and foot of cup struck with mark of maker Michel Haussner.